How inspiring is that? 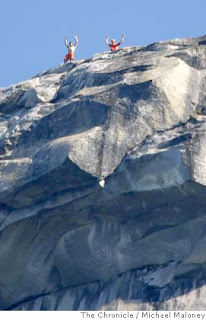 They wanted to complete their goal so badly that they stubbornly climbed El Capitan multiple times in a week. Congratulations to Hans and Yuji. There is no doubt that they worked hard to get there. And with that energy being my fuel, I've decided to make today Double Workout Wednesday. FARTLEK! Sorry, was that me?